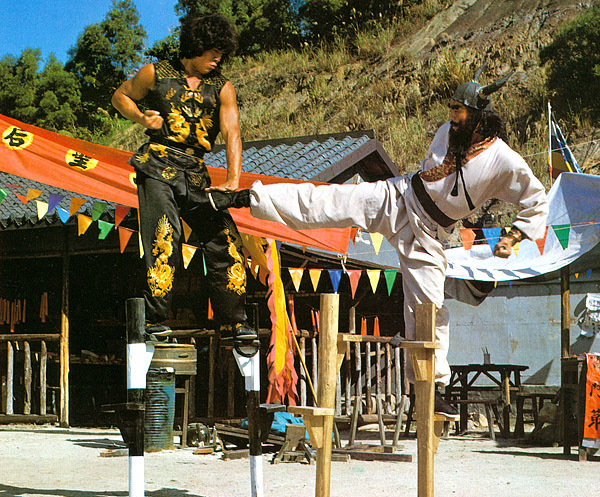 The 1982 Corey Yuen crossover actioner Long zhi ren zhe (aka Ninja in the Dragon’s Den and Legend of the Ninja) was a double vehicle, with two equally marketable leading men. 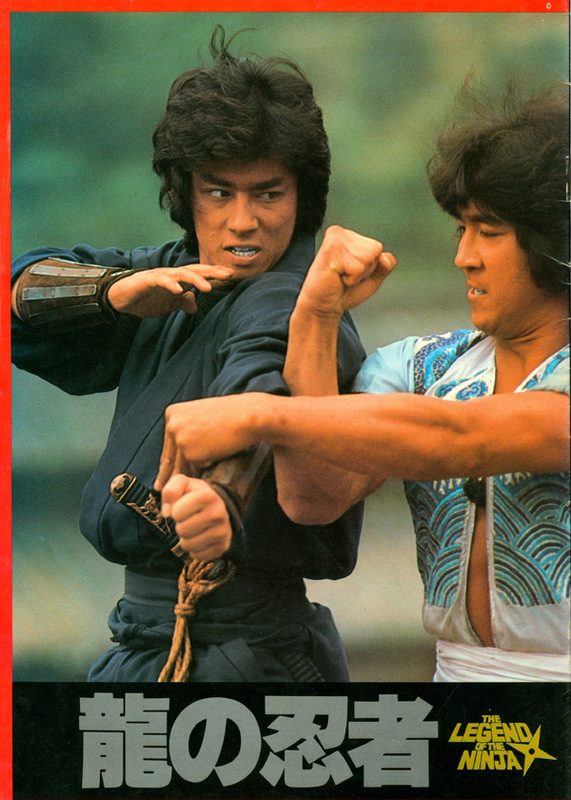 Conan Lee was *going to be* the more muscular, harder-edged Jackie Chan. Hiroyuki ‘Henry’ Sanada was taking off as the prodigy of the Japan Action Club, with Roaring Fire and Ninja Wars, plus a stint on Kage no Gundan, all in the same year. Each man could be given lead billing in his native land, leaving the other to be billed as an exotic import from another country. Win-win. These press stills are from the Japanese theatrical release program, and there’s a lot of them, so I’ll break this down into installments. Note the differences in head gear from the staged publicity shot above and the on-set still from the film below. Different gauntlets, too. This might have been an early version of the costume, or a second suit used in the MANY stunt shots throughout. 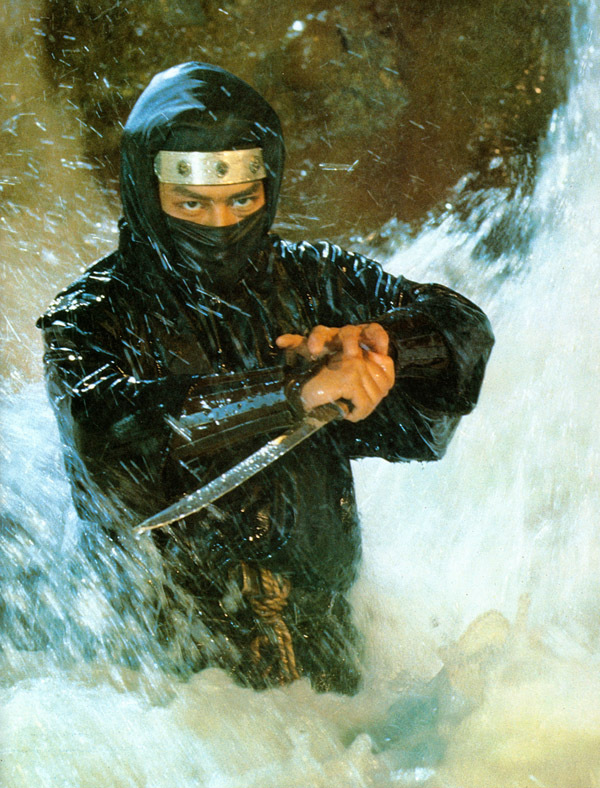 Sanada plays a ninja on the vengeance trail, hunting down all those responsible for his father’s death years earlier. His final target has lived in exile in China, where he’s trained a local to become a formidable martial artist himself. 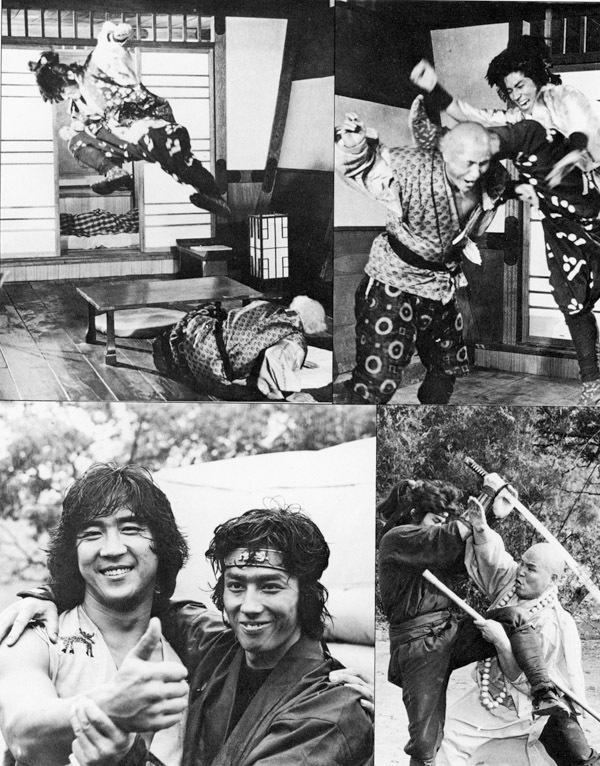 These two clash, much to the chagrin of ‘uncle’ who on his deathbed reveals some decades old secrets that unite the fighters as martial arts soul brothers. Just in time, too, as they are attacked by an evil wizard and his Shaolin army! It’s a fight-PACKED flick, with some kung-fu slapstick, rather good ninja-on-ninja action, a long battle in a shinobi-proofed pagoda and some of the best kung-fu vs. ninja stuff ever filmed. Yuen did a superb job melding Japanese and Chinese movie martial arts. Sanada’s screen ninjutsu is mutated with some high kicks, spins and flourish to be more compatible with Lee’s screen kung-fu, which was always a bit stiffer and more Japanese karate-like than a lot of his Hong Kong contemporaries. 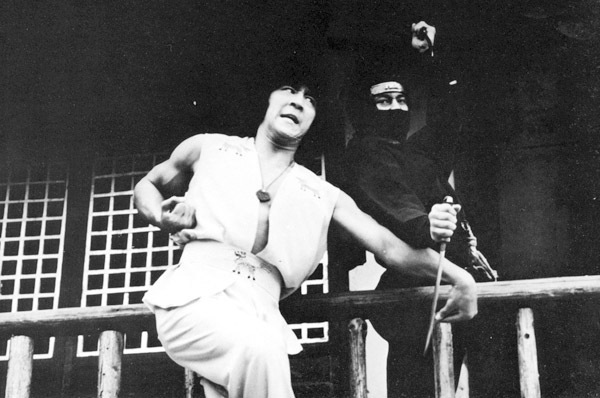 Conan Lee may not have had the prolific, multi-genre career Sanada went on to, but his fight scenes on stilts in this flick are absolutely unforgettable. He followed up NitDD with roles in beloved 80’s camp Gymkata and played a ninja in the sci-fi schlocker Eliminators, before nearly killing himself in an insane stunt in Tiger on the Beat II. 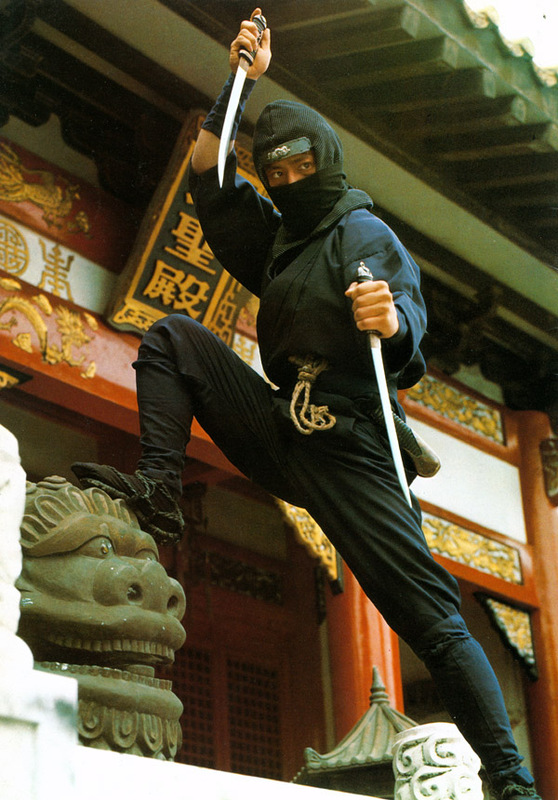 Sanada’s ninja gear here is a perfect nexus of 60’s and 70’s Japanese move/TV and the less pillowy, more lean cut used in American ninja films in the 80’s. The armored headband motif would largely disappear in the 80’s though, and not make a comeback until the 2000’s with Naruto. This shot was the inspiration for the Mexican painted lobby card we featured way back here. The Illuminated Lantern has a great write up here, including some lyrics from the absolutely unforgettable theme song! 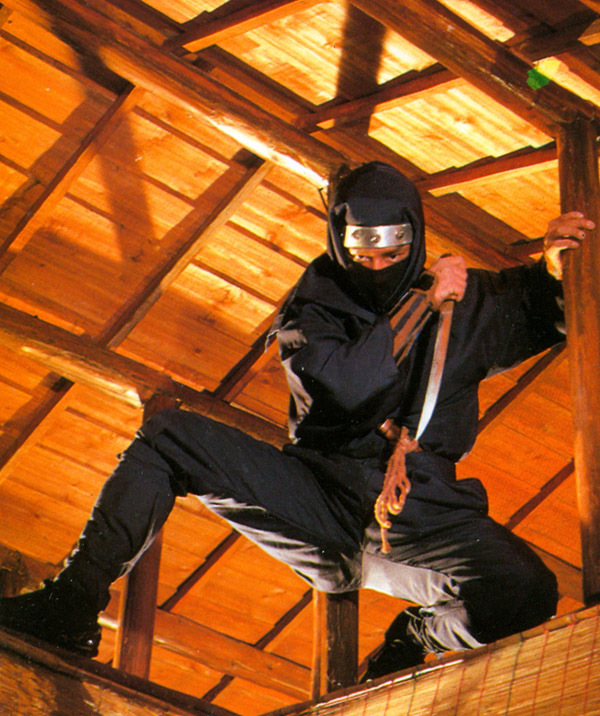 The ancient in web years but enduringly invaluable “Return of the Ninjas” site also has a review with package art and posters here. One of the more common grey market releases was reviewed at HK DVD Heaven.